Originally, the idea was on the scale of a tiki hut with a TV, but as discussions ensued with the enthusiastic homeowner, it escalated into a mega project. In the end, a pool house, deck, and projector shed were all constructed from the ground up. But before any work began, the existing pool had to be sealed and resituated from its original location to where it is now. 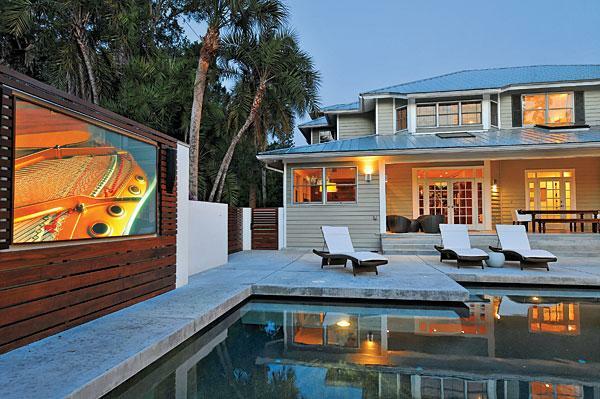 Taking 18 months from concept to completion, the project set a new benchmark for Sarasota-based SmartHouse Integration, which handled the job. According to SmartHouse President Mark van den Broek, the Odegards wanted a stylish, relaxing, outdoor entertainment center where they could watch movies and sports all year long while lounging at the pool. The decision to do new construction in the backyard created the opportunity to pull out all the stops. Admittedly, van den Broek says, he had done nothing quite like this outdoor theater before, but he and his team quickly got their minds around the job. “We had some minimum throw distances for the projector to work around, and that determined where the screen would go, how big a projector was needed, and how big a structure we needed to fit that screen size,” he says. An immediate challenge was the tight backyard space. The neighbors have structures that closely adjoin the property on two sides, so there were no buffers, and it wouldn’t do to chew up a big chunk of valuable living space to accommodate the projection gear. “We had to come up with a design that would optimize every square inch available,” van den Broek says. The result? A custom shed—both air-conditioned and insulated—was built and elevated off the ground so it wouldn’t count as a footprint. Situated at the end of the pool, directly opposite the new pool house, it houses a permanently installed 102-inch Stewart StarGlas rear-projection screen. Inside the structure is a Digital Projection M-Vision Cine 400 projector with 5,500 lumens of light output, which is powerful enough to make daytime viewing possible. A fun but practical addition is a retractable bimini top that serves as a brim for the screen when the sun comes overhead and tries to wash it out. SmartHouse worked with Gregory Arthur of Onyx Development Group, who was instrumental in the construction of the pool house, deck, and projector shed. The shed is attached to a fence right up on the property line and isn’t an easy or convenient place to access, so the rest of the gear resides in the pool house. An OmniMount rack holds a Samsung Blu-ray player, a DirecTV HD receiver, a Yamaha Aventage RX-A2010 receiver, as well as two Crown Audio power amplifiers. Video signals run the long distance from the equipment room to the projector house over a fiber-optic HDMI balun kit. A pair of JBL Professional CBT 70J weatherproof speakers sit on either side of the screen for the front channels; each is a large 27-inch-tall column with four 5-inch woofers and 16 1-inch dome tweeters in a coaxial line array. A JBL Professional Control SB210 outdoor subwoofer with dual 10-inch woofers—which van den Broek jokes is the size of a Volkswagen—is hidden behind the wood fascia right below the StarGlas screen. A pair of JBL Professional Control 25 loudspeakers mounted under the pool house eaves serve as surrounds. The pool house is equipped with an Elan g! Series HC4 system controller and an M86A integrated audio/video controller for multiroom audio; along with handling control for the theater system, the M86A manages the pool house’s four interior audio zones and two additional exterior zones. All the zones—including the theater system—are tied into a Sonos music server that feeds another eight-zone system in the main house. Everything—including the multiroom audio, projector, LED landscape lighting, pool house HVAC, and even the pool equipment—can be controlled via an iPad or iPhone using the Elan g! system controller. This was a draw for Odegard, a self-described non-techie but big Apple advocate, and he’s thrilled with how easy it is to operate. “I don’t want to manage 15 remotes, and I love running the whole house on my phone,” he says. “We have a real common-sense approach,” van den Broek says. “He’s an Apple guy, so this was a perfect fit with the Elan system. When he presses Watch TV, the receiver and amps turn on and everything comes to a preset volume. We have it dialed in where it really is the touch of a button.” An Elan TS2 in-wall touchscreen in the pool house allows anyone to control the whole system from inside as well.